Extra Large Update + Reader Challenge! I will try to keep the type-age about day to day life to a minimum.. I have a bunch o'photos to share. Here goes.. 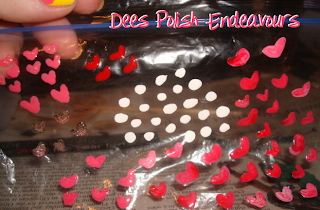 Here are the nail decals I made to go towards my Valentine's Day mani, buuuut.. I used them and I love the idea of making your own, but I ended up taking off the look because I absolutely hated it. It was almost 11pm the night before (I had to work at 7:15am) but I needed to have my nails painted.. So.. 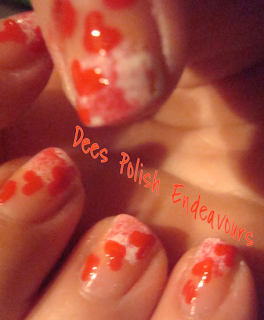 These were the nails I sported just before my V-Day mani.. I wanted to try out that whole toothpick deal.. I actually really liked this and could not stop looking at my nails. I love when you do a look that you cannot stop looking at. I will do with different colours and such some other day.. Plus I think I might want a base colour first.. I'm thinking red with the black and white.. We'll see!! My new children! I have actually had this for over 10 days!!!! and never posted them.. Horrible, I know! I am still trying to think of the perfect look for JITNB and DSP.. But I decided I just HAD to try For Audrey, so here is what happened.. I am a little ticked that I put on my top coat so quickly on my left hand (re: smudging on my thumbnail) but I wanted to return to the living room and watch the rest of the hockey game.. Urgh! Ahh well.. I posted my left and right hand because this is a look where I like the right hand better.. AND! I love For Audrey on black! So excellent! Speaking of For Audrey, I think this polish was overhyped for me. I was sooo pumped to finally get my mitts on it.. And I was thinking when I slapped on this polish that time would stand still.. It didn't. I like Mint Candy Apple more. Ahh well, I am still pumped to have this gem as a part of my collection!! I did receive a challenge! 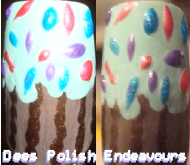 It was from Tierney and it was to try and do cupcake nails. This is what I came up with.. Is this is sort of close to what you were thinking of, I will totally post a tutorial - let me know! If not, I have one other idea.. I love the toothpick thing. I did that with christmas colors for one of the many holiday parties I went to. I really like the colors you did though, it looks really great. I also love what you did with For Audrey, that looks AWESOME. 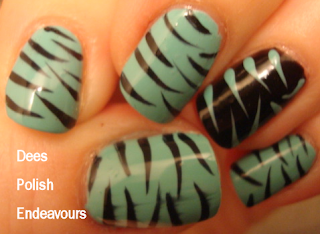 I love finding canadian nail bloggers....as I am having difficulty finding certain polishes. I'm from vancouver and we do not have a sallys around here so new collections of nail polish are really hard for me to find. I was wondering where did you get the mad hatter opi nail polish? I think I need it. Wow all your nail looks are simply stunning! I especially love the toothpick one, at first I thought it looked weird, but now you've inspired me to give it a go! toothpick nail design. I need to know how you did that.